The rarest Moyr Smith Shakespeare tile! The Aesthetic Movement and the Arts and Crafts Movement occupied the same space in history* and both initially took their design cues from the same roots in medieval art, they are distinguished by their approach to the manufacture of their artworks. 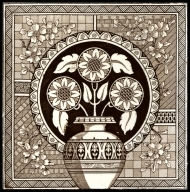 The aesthetic movement, as the arts & crafts movement did, adopted styles such as gothic and japanoiserie and included these elements in their designs, taking their cue fron japanoiserie they also created a characteristic form of art in miniature with a single design encapsulating several vignettes or divisions each carrying a different artistic representation. Decorative borders and backgrounds with florally inspired and geometric patterns were also a feature as was the diagonal line. The Arts and Crafts Movement emphasised the bond between the artist and his work suggesting that ideally the designer should also be the craftsman and at the minimum the craftsman should have an understanding of all the processes involved to make a finished object. 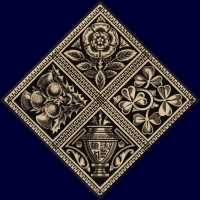 They renounced industrial processes as being remote from the individual and for producing inferior wares yet this clearly was not the case as even the stalwarts such as Wm Morris and Wm de Morgan bought in part finished goods, subcontracted manufacture and used limited mass production techniques. 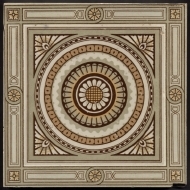 It was a worthy ideal but far from practical, clearly limited the scope of their output and its affordability indeed the conundrum arose that whilst theoretically being supportive of the artist/craftsman the result was that the ordinary craftsperson could not afford to buy the products that they made, the cost of single tile could exceed the weekly wages of the skilled decorator of that same tile. Arts and Crafts products therefore remained exclusively the province of the affluent classes, William Morris vowed that he would never permit his designs to be used on industrially produced objects. In contrast the promoters of aestheticism worked closely with industry to spread good designs at affordable prices and as technology moved forward so did their design and products. The artists worked in the tileries and factories and understood the technology and processes even to a great extent than Arts & Crafts workers. Unrestrained by the neccessity to manufacture predominently by hand much finer and more intricate artworks were enabled, for example by lithography printing and dust pressed moulding, and these products were affordable by the ordinary 'man in the street'. 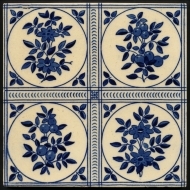 It is notable that all of the traditional art tile makers were phased by the advent of art nouveau, the most famous 19thC tile makers failed to get to grips with the new style and the technologies that enabled it. 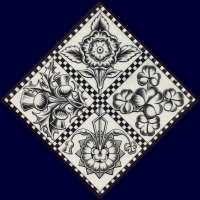 Morris & Co, de Morgan & Co, Shrigley & Hunt, Doulton Lambeth, even Mintons China Works and Wedgwood all ceased tile production late 19th/early 20thC. Many great artists that have become associated with Arts & Crafts were more of the aesthetic persuasion than Arts & Crafts, John Moyr Smith, Augustus Welby Pugin, E W Godwin and Christopher Dresser amongst others unashamedly worked with major manufacturers of the day. Many of their designs can not be positively identified as they were assigned to the manufacturer and indeed they inspired and were inspired by other artists of the day who produced similar works as is always the way in art. Factories sponsored fledgling artists through art school and employed them full time as in-house designers wherein they could work with the technologists in producing great finished products, many of these great artists are unknown and unrecognised today and their works tentatively attributed to known artists. Whilst due deferrence is given to the outstanding works of the Arts & Crafts companies their standard production was often inferior to the standard production of the larger companies. 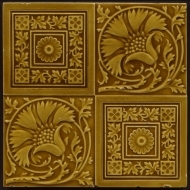 Shining examples of larger scale art tile makers like Maw & Co and Sherwin & Cotton were leaders in driving forward art and design with new materials and technologies and produced tiles at least the equal of the Arts & Crafts companies. *Here I refer to the British Arts and Crafts movement, in the USA the phrase has a broader definition including styles as well as processes and is used for some 20th century artworks which were often industrially made. There is clearly considerable overlap in the styles adopted by both the Aesthetic Movement and the Arts & Crafts movement and so the latter is used in its original sense of the means of production that the works should be substantially made and at the minimum decorated by hand.